U.S. Apprehended Record Number of Migrant Families At Southwest Border A record number of migrant families arrived at the Southwest border over the last year, despite the Trump administration's effort to deter illegal immigration by separating families at the border. 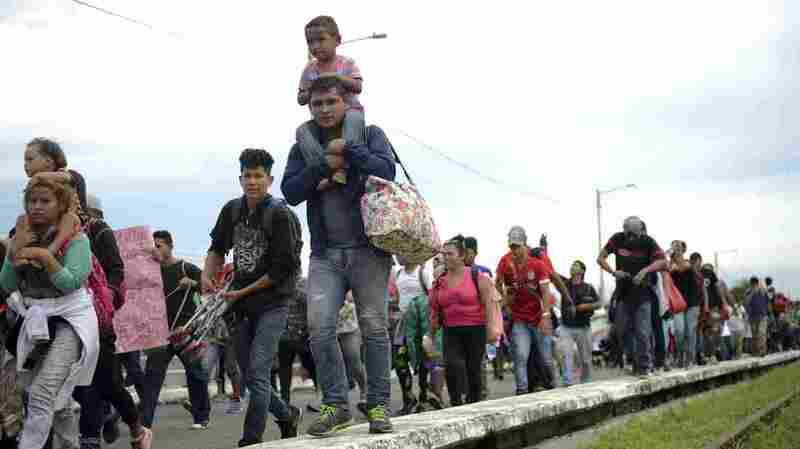 Thousands of Honduran migrants and families walk towards the southern Mexico border from Guatemala. Many say they are headed to the U.S. The White House said on Tuesday that a record number of migrant families have arrived at the Southwest border over the last year. The White House says it's seen a "record-shattering surge" of migrant families at the Southwest border in the past year — and wasted no time trying to blame those rising numbers on what it calls "loopholes" in U.S immigration law. More than 161,000 migrant family members were apprehended or found inadmissible at the Southwest border in FY 2018, which ended last month. That's according to figures released today by U.S. Customs and Border Protection. The number of family units apprehended by immigration agents has been rising steadily since the summer, to a record total of more than 20,000 in September. That's despite the Trump administration's policy, which it's since abandoned, of separating migrant families at the border to deter illegal immigration. This is a crisis that is unprecedented in our history. Overall, the number of undocumented immigrants — including family units and those crossing alone — apprehended at the border last year held steady at about 521,000. That's a slight decline from the fiscal year 2017 total, and far below the high-water mark of the 1990s and 2000s, when more than a million apprehensions a year was routine. But a senior administration official insisted that comparison is misleading. "This is a crisis that is unprecedented in our history," the official said on a conference call with reporters. A generation ago, the official said, the vast majority of immigrants were adults from Mexico, and most could be deported quickly. But that is not the case with migrant families and unaccompanied children from Central America, many of whom are seeking asylum in the U.S.
"This is not an issue of being able to get physical custody of an alien," the official said. "The problem is that once apprehended, they can't be sent home." Most of the migrant families and children arriving at the border today come from Central America. Under U.S. law, and a long-standing legal agreement known as the Flores settlement, many of them have to be released into the U.S. to wait for their day in immigration court. Because of lengthy court backlogs, their cases can take months or years to play out. With just weeks to go before the midterm elections, the White House is arguing that Democrats are to blame for the surge in family migration. "As a result of Democrat-supported loopholes in our federal laws, most illegal immigrant families and minors from Central America who arrive unlawfully at the border cannot be detained together or removed together, only released," said President Trump in a written statement. But immigrants' rights advocates see those same policies as crucial protections for families and children who are seeking asylum in the U.S. And they dispute the notion that U.S. immigration policy is what's driving those migrants to leave their homes in the first place. They argue that migrants are fleeing from violence and economic hardships in the so-called "northern triangle" countries of Honduras, El Salvador and Guatemala — conditions that could get worse if President Trump follows through on his threat to take away foreign aid because of the migrant caravan that's making its way north across Mexico.